Few Clippers - An Apology-Free Thanksgiving Day? 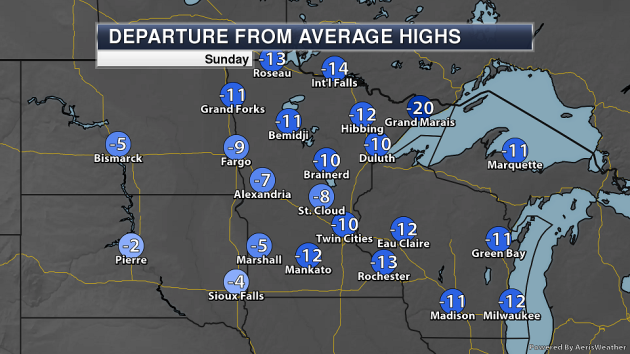 We have not hit zero so far this winter in the Twin Cities, but we did see a low of 7 back on Tuesday (the 13th). 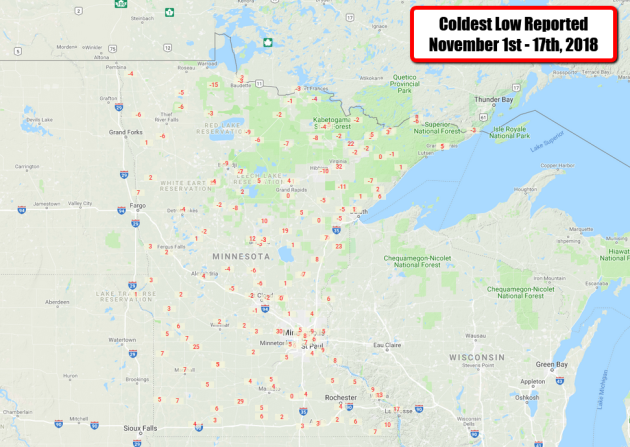 The average first subzero low in the Twin Cities falls on December 9th. Snow fell Friday Night mainly south of I-94. 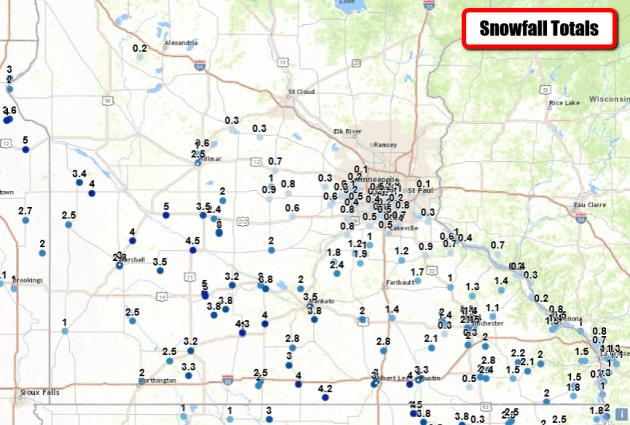 Up to about three-quarters of an inch of snow was reported in parts of the south and west metro, with 0.1" officially at MSP airport. The top total reported in the state was 5" in Sacred Heart and Springfield. "It's tough to make predictions, especially about the future" mused Yogi Berra. I nodded in sympathy as Al Roker (NBC's Today Show) apologized on the air for a busted forecast on Friday. The models were hinting at an inch or 2. New York City picked up 6 inches, turning the city into a parking lot. 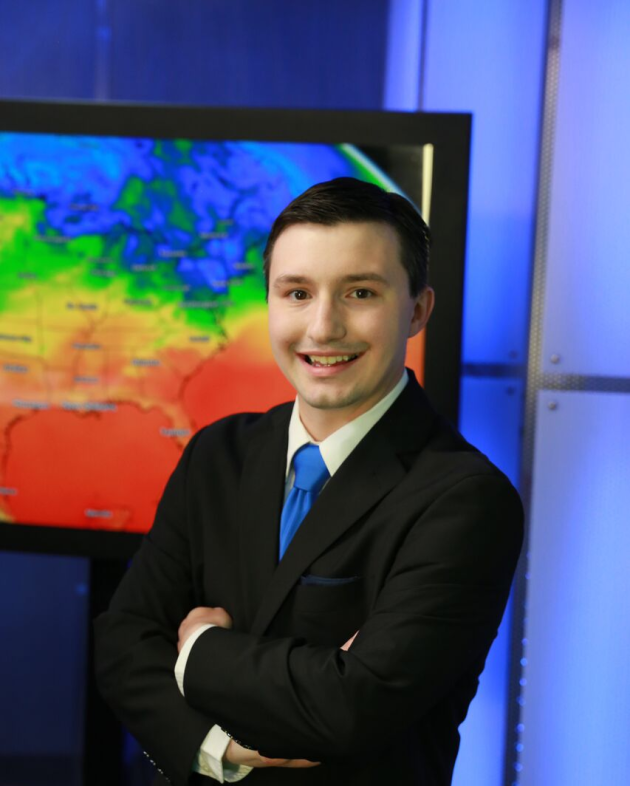 The same people who'd rather not talk about their "Fantasy Football" picks are quick to vilify meteorologists for making a wrong pick. "You have gleaming Dopplers, light-dimming supercomputers and a constellation of weather satellites. Why can't you get it right ALL the time!" It seems we all want perfection in an imperfect world. New tech and better models help, but weather is inherently messy and chaotic. It's getting better, but the 7-Day will never be perfect. That said, I hope this outlook pans out. 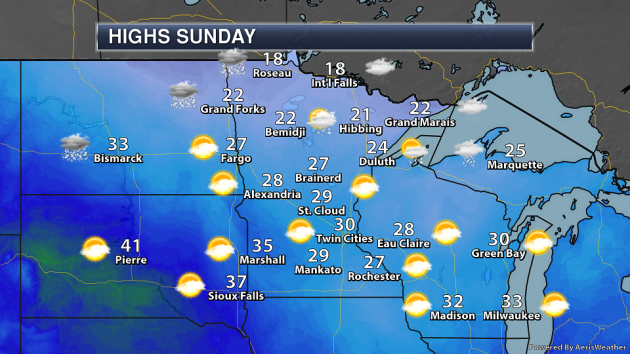 A cold and quiet Sunday gives way to Monday flurries; an inch or 2 north of Mora. A Pacific breeze warms us into the 40s by late week. Thanksgiving looks dry, but light rain Friday may end as a mix Saturday PM. No mega-storms or arctic punches are in sight. Apology-free weather! SUNDAY: Cold start, blue sky. High 33. Low 25. Chance of precipitation 0%. Wind SW 8-13 mph. MONDAY: Early flakes, then partial clearing. High 32. Low 16. Chance of precipitation 30%. Wind N 10-15 mph. TUESDAY: Clouds increase, late flurries? High 34. Low 26. Chance of precipitation 30%. Wind SW 8-13 mph. WEDNESDAY: Intervals of sun, cool breeze. High 31. Low 24. Chance of precipitation 20%. Wind N 8-13 mph. THURSDAY: Some sun, windy - relatively mild. High 45. Low 33. Chance of precipitation 20%. Wind S 10-20 mph. FRIDAY: Chance of light rain or drizzle. High 46. Low 36. Chance of precipitation 60%. Wind S 10-15 mph. SATURDAY: Rain may mix with wet snow late. High 41. Low 29. Chance of precipitation 70%. Wind NW 8-13 mph. 1994: 58 to 69 mph wind gusts result in isolated damage to structures across south central and southeastern Minnesota. Some of the counties included were Blue Earth, Faribault, Freeborn, Goodhue, Le Sueur, Nicollet, Rice, Steele, and Waseca. 1979: A heat wave continues in Southwest Minnesota. The temperature hits 70 degrees at Browns Valley. Another cool day is expected across the state Sunday, with highs in the teens in northern Minnesota but reaching the 30s in southwestern portions. A few snow showers will be possible across northern Minnesota, especially later in the day, with clouds on the increase across much of the rest of the state. 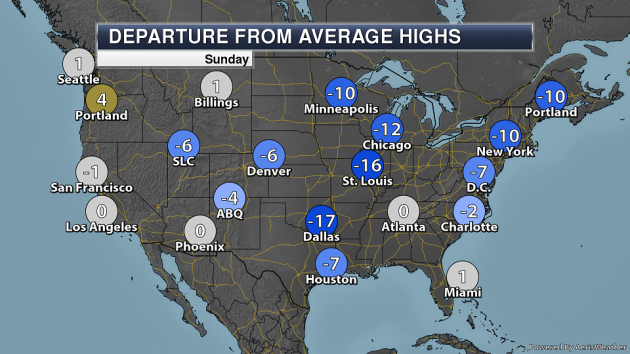 These highs will once again below average across the state Sunday, with most locations a good 5-15 degrees below average. After our cold weekend, we do see warmer temperatures make a return for the second half of the week of Thanksgiving. Highs by Wednesday should climb into the 40s and remain there through the holiday and into at least the first half of the weekend for any shopping trips you may have planned. After that, it looks like the bottom could fall out once again heading into the last few days of November. 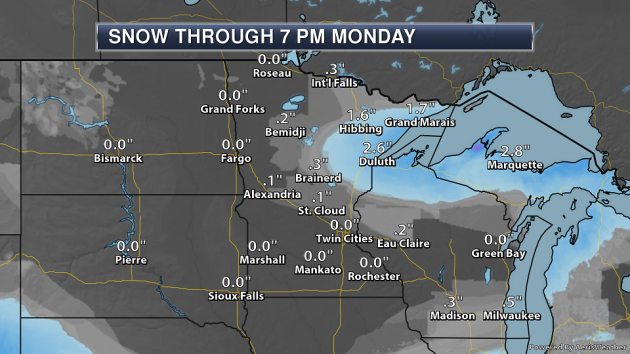 A system passing across mainly northern Minnesota will bring snow chances along with it Sunday into Monday. The heaviest snow totals are expected in northeastern Minnesota, especially along the higher elevation areas of the North Shore, with 2-4” possible. This system could bring a dusting as far south as central Minnesota, with maybe a few flurries in the Twin Cities to wake up Monday morning. In the Twin Cities, we’ll remain mainly dry through the Thanksgiving holiday with just a few chances of flurries Sunday Night to early Monday as well as Tuesday. Our next main chance of precipitation doesn’t ride into the region until Black Friday and into next weekend, and right now it could be warm enough for a mix of rain and snow. 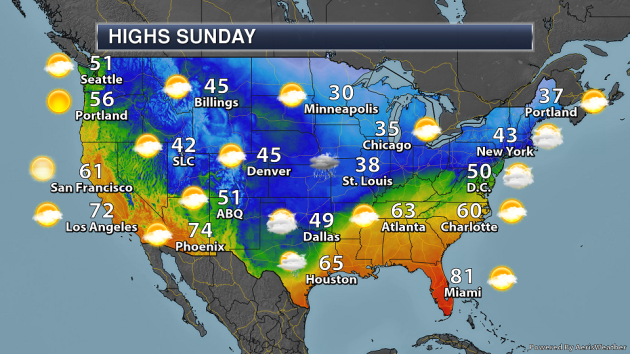 On Sunday, an area of low pressure will help to bring some snow to parts of the northern Ohio Valley and eastern Great Lakes into the Northeast. 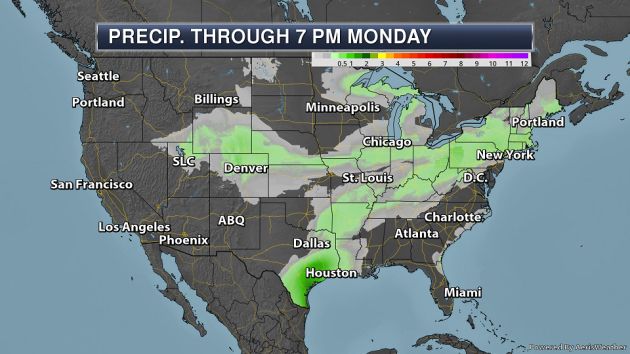 In association with a cold front, a few rain showers will be possible from the Ohio Valley into the Southern Plains. The heaviest of the rain will fall across southern and southeastern Texas. A cold front dropping south and an associated low pressure area will help bring a few snow showers by late in the day from eastern Montana into the northern Great Lakes. The heaviest rain through Monday evening will fall across parts of southern and southeastern Texas, where 1-2" could fall. There is a marginal threat of flash flooding along the Texas coast Sunday due to the heavy rain threat. 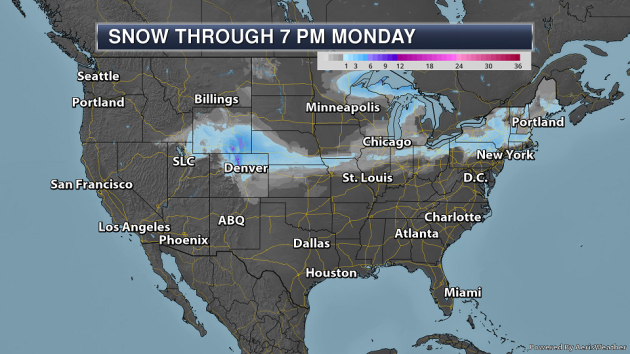 A band of snow will fall through Saturday night from the Rockies to the Ohio Valley. After that, the heaviest snow - with several inches possible - will fall across parts of the northern Great Lakes late Sunday into Monday. More from Scientific American: "In what was already a record-setting fire season for California, two blazes have dealt another devastating blow to communities in the state. The Camp Fire, the deadliest and most destructive wildfire in California’s history, gutted the northern town of Paradise in hours as the flames of the Woolsey fire tore through the southern beach enclave of Malibu. Collectively they have torched more than 200,000 acres and left at least 63 people dead and dozens more missing. Pres. Donald Trump laid blame on what he deemed insufficient forest management practices. Fire experts quickly countered that even though fire suppression strategies in previous decades had made some forests denser (allowing for bigger, hotter blazes), different factors were at play in the current wildfires. Dry, windy weather after a hot summer and the tinderbox nature of the vegetation involved—grasses and shrubs in the Woolsey fire, and a mix in the Camp Fire—set the scene for the fires’ explosive nature. Scientists have also pointed to the influence of climate change in prolonging California’s dry season and fueling hotter summers that further desiccate plants. One of the biggest reasons wildfires are creating such huge disasters in recent years, though, is the expansion of the West’s population into fire-prone wildland areas—what experts call the wildland–urban interface (WUI). It is in these frontline communities where Alistair Smith, a fire researcher at the University of Idaho, thinks significant changes can be made to reduce fire risks via biomimicry, or copying nature." More from the New York Times: "In the United States, Yellowstone National Park is the only place bison and wolves can be seen in great numbers. Because of the park, these animals survive. Yellowstone was crucial to bringing back bison, reintroducing gray wolves, and restoring trumpeter swans, elk, and grizzly bears — all five species driven toward extinction found refuge here. But the Yellowstone of charismatic megafauna and of stunning geysers that four million visitors a year travel to see is changing before the eyes of those who know it best. Researchers who have spent years studying, managing, and exploring its roughly 3,400 square miles say that soon the landscape may look dramatically different. Over the next few decades of climate change, the country’s first national park will quite likely see increased fire, less forest, expanding grasslands, shallower, warmer waterways, and more invasive plants — all of which may alter how, and how many, animals move through the landscape. Ecosystems are always in flux, but climate change is transforming habitats so quickly that many plants and animals may not be able to adapt well or at all." More from the New Republic: "When Amazon announced on Tuesday that it would build one of its new headquarters in Long Island City’s Anable Basin, environmentalists were quick to notice that the site could be partially underwater by 2050. By the next millennium, it will be completely submerged, according to the environmental research group Climate Central’s most recent projections. Situated in an inlet along the East River, the site is currently home to parking lots and warehouse spaces, but when Amazon breaks ground, which could be as soon as 2019, new apartment complexes and office buildings will go up—all of which would be vulnerable to flooding if sea levels rise even just a few feet. After Hurricane Sandy battered the East Coast in 2012, New York City adopted new building codes to help minimize the damage of such flooding. Today, developers working in flood zones are required to elevate their buildings above the anticipated water level in a storm. An additional set of guidelines for waterfront developers recommends that they build floodgates and levees, create wetlands and barrier islands, and elevate surrounding land to address flooding and erosion. But these recommendations are nonbinding—it’s up to developers to decide whether or not they want to put up the money to build such green infrastructure. For Amazon, this means that any attempts to shore up its Long Island City site will have to be entirely on its own steam."